What is the Best Phone for Off-roading? I have always been a gadget guy, interested in the latest mobile devices. I had the iPhone 3G, 3GS, HTC Evo, Samsung Galaxy S3, and most recently the Note 3. All of these devices have their own set of pros and cons. 1. Camera quality. As an off-roader, blogger, and photographer, having a great camera with me at all times is important. So a clear, crisp, feature-rich camera is my #1 priority. 2. Durability. My phone is subject to a lot of travel, mud, water, snow, and being in a dirty garage. 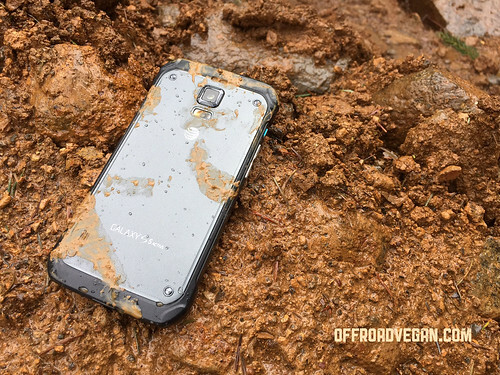 And, with the high cost of phone replacements, I want a device that is rugged and durable. 3. Operating system: I used to be an iPhone guy, but not being able to add my own storage for those long weeks in Moab was a pain. Also, not being able to swap the battery with a fresh one was a drawback. Instead of choosing a lower-tier OS (like Windows or Blackberry) I chose Android. I was excited to go in for my upgrade and purchase the Samsung Galaxy Note 4. However the Galaxy S5 Active caught my eye. 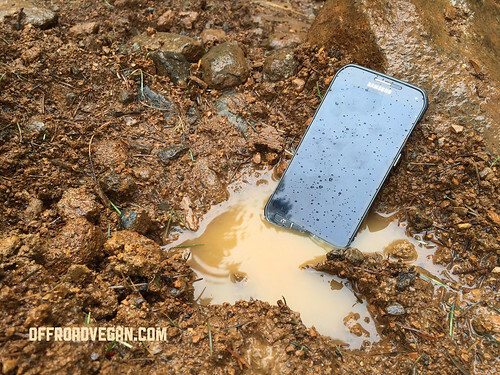 My phone, in a mud puddle on Rocky Uphill. I like that it is waterproof. Not just resistant, but proof. As in they added an active shutter button to the side of the camera so you can actually record video underwater. Anyone that Jeeps in the PNW knows we get a lot of rain, and now I can take photos in a downpour without worrying. It is also mud and dust proof. If I get out of the Jeep and it falls into a mud pit, or on the granite of the Rubicon, I don’t need to worry. Another nice feature is being able to simply wash it with a dish sponge and rinse it in the kitchen sink when you get home. Samsung exchanged the capacitive buttons from the Notes and S5 with physical buttons on the Active. This makes using your phone with gloves on a lot easier. No more removing ski gloves to snap a quick photo on the slopes. Phones and mud never went well together. Until now. This is, perhaps the best phone for the off-road community. With an amazing camera, mil-spec (IP67) water/dust/shock proofing, and a great Android-based operating system you will be hard pressed to find a better phone. Oh man seeing a phone in water like that just makes me feel uneasy! It’s not natural! !